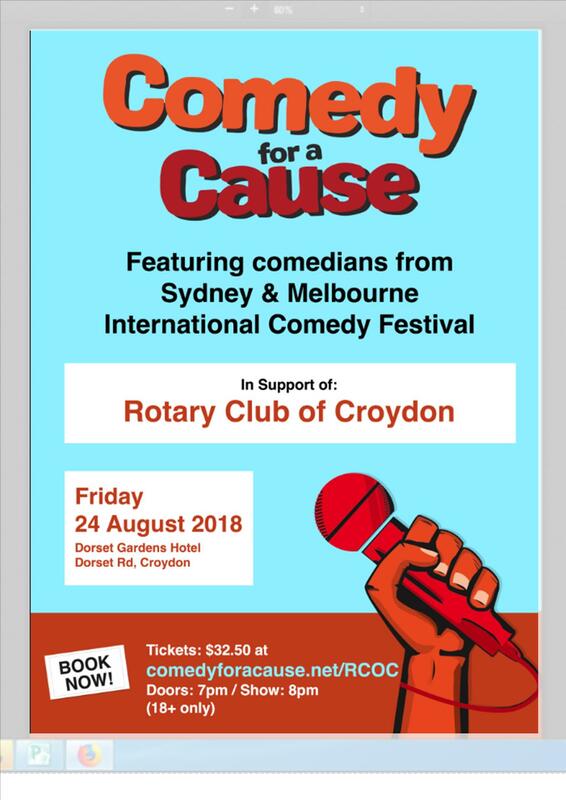 The Rotary Club of Croydon have a cracker of a night planned on the 24th August where we are hosting a suite of Comedians from the Melbourne and Sydney International Comedy Festival! So why am I telling you this?… We need your help! We have just released tickets and would love it if you could come along and join us for a night of fun and spread the word among your friends, family and professional network! The tickets are available online for $32.50 at Comedy For A Cause (http://comedyforacause.net/tc-events/rcoc/) and are of limited offering so please be quick! If you can’t make it, that’s ok! we would appreciate any support if you could give us by sharing this event listed on our facebook page (https://www.facebook.com/events/1804763852913447/) and distribute the attached poster!